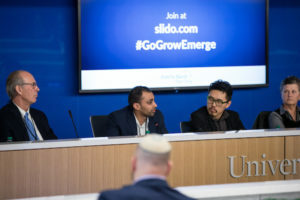 WHT attorney Michael Kunjoo was chosen as a panelist for this year’s EMERGE conference held on March 12, 2019 at the University of Kentucky Gatton Student Center. Michael was part of a four person panel discussing “Coopertition”. The panelists, each from different professions, discussed their personal experiences in dealing with competition in their respective fields and provided thoughts and tactics on how to navigate the sometimes blurry line between competitor and colleague. EMERGE is a full-day event that brings together entrepreneurs, emerging leaders, business professionals, and community members. This exciting professional development opportunity offers networking, access to community leaders, and education through breakout sessions in a variety of tracks, such as professional, personal, and community. Learn more about EMERGE and this year’s conference here.